Many of the venues from the 1992 Olympics in Barcelona will serve as the sites of the different X Games events. The Olympic Stadium that hosted the track and field events will be site of the X Games' Moto X and Rally Cross events. The BMX and Skate Vert events ramp will be set up at the area next to the former Olympic diving pool. And the Big Air comp will take place inside the arena where gymnastics and volleyball were held back in 1992. X Games Real Women. Similar to the way the surf competition was set up as an online voting contest for X Games Foz do Iguacu, there is an X Games Real Women online voting competition for Barcelona where you can watch 75 second video parts and then vote for who should win the fan favorite. 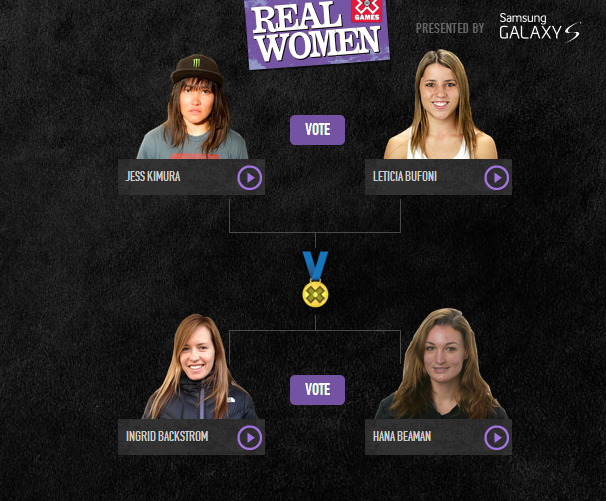 The competition is down to 4 women: Jess Kimura, Leticia Bufoni, Hana Beaman and Ingrid Backstrom.